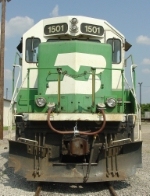 Description: A pair of cascade green GP28Msincluding unpatched OLS 1523 sit at Streator. Description: Rochelle Railroad Park. Taking interchange petro WB to Flagg Center. Description: Rochelle Railroad Park. Lite power returning from drop-off at Flagg Center. 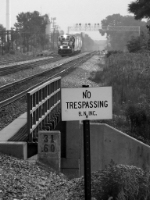 Description: An old BN No Trespassing sign is still in place at the east end of the Route 59 platform. New signal bridge aside, this photo easily could have been taken 15 years earlier. Description: The 452 heads west at 11:44AM with eight cars bound for Eola. Description: Sitting at the BNSF Barstow Yard. A white face. Been awhile since I've seen a white face at Barstow. Description: L-CHI101 had a GREAT LEADER! Description: A BN-painted GP39V leads another switch job, working the other side of Eola Yard. Description: A GP28P trails on the switch job. Description: BNSF 2956 & 1501 return to the east end of BNSFs yard at Eola, IL with a local train. Description: BNSF 2956 & 1501 return to the yard at Eola, IL with a local freight. Description: BNSF 1501 & 2956 lead their small train through the yard at Eola, IL. Description: BNSF 1501 & 2956 lead a short train through the yard at Eola, IL.